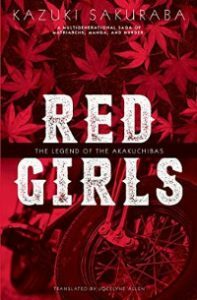 There are a ton of reasons why you should be excited about/immediately grab a copy of Red Girls (I’ll tell you those reasons below), but what makes Sakuraba’s novel stand out is that it’s the ONLY SFF novel by a woman translated into English this year (at least, that I’ve found). We know that women all over the world are writing SFF, and it’s time more of their books were translated into English. But back to Red Girls. At just over 450 pages, it is a multi-generational saga, focusing on three women in the Akakuchiba family (the “red” in the title refers to the “Aka” of the family name). Sakuraba links the passing of each generation to Japan’s quickly-changing post-war society, and asks us to consider how each matriarch deals with the expectations and hardships of her particular cultural moment. Manyo Tada, arguably the novel’s central character, even after she’s dead, is the first matriarch we meet. Abandoned several years after WWII in the village of Benimidori by the “outlanders” who live deep in the mountains, Manyo is taken in and raised by a local family. Early on, she realizes that she is clairvoyant, and many random images prove to be flashes of future events/people. When Manyo is handpicked by the reigning matriarch of the Akakuchiba family (and its lucrative steelworks facility) to marry the heir, Yoji, and join the illustrious family, she can sense the changing times. Manyo’s children- Namida (“tear”), Kemari (“hairball,” born in the year of the Fire Horse), Kaban (“bag”), Kodoku (“solitude”), are named by her mother-in-law, Tatsu, for her own mysterious reasons. Each child, in turn, exemplifies the various strains of Japanese culture as it moves through the Cold War years and beyond. Namida participates in the brutally competitive world of scholastic achievement; Kemari shifts from being the rebellious leader of a girls’ motorcycle gang to becoming one of the country’s most popular manga artists; Kaban obsesses over televised talent shows and auditions as often as she can during her teenage years; and Kodoku isolates himself in his room as a kid and then as a teenager, playing video games and reading manga, convinced that participating in society is pointless if the world is just going to end in nuclear holocaust. Part Two (1979-1998) focuses on Kemari’s escapades as a motorcycle gang leader and then, with the (accidental?) death of her brother Namida, her life as a wife, mother, and manga artist. With the male heir gone, and the Akakuchiba family and steelworks requiring a strong male figure to take over once Yasuyuki Akakuchuba dies, Kemari agrees to an arranged marriage. And while she gives birth to Toko in 1984, she leaves the girl’s upbringing to Manyo and pursues her grueling work of churning out popular manga every week. Toko haunts the entire story as narrator, even though she isn’t its focus until Part Three. And it is this obsession with telling her family’s story, as well as her own, that drives this tale of the Akakuchiba clan. Through her memories of Manyo and Kemari, and the stories that they told her of their childhoods and lives in post-war Japan, Toko attempts to understand her own crushing ennui, aimlessness, and isolation. Is she simply a product of her generation, searching for purpose and direction? Is she trapped in a kind of stasis because her family, the bedrock of Benimidori, has crumbled away and she doesn’t know how to escape the rubble? Through it all, the Akakuchiba Steelworks facility stands like an eternal monument, a claim that Japan’s prosperity will continue forever. And yet, as times change and international markets shift, even the steelworks must face demolition. Ultimately, Red Girls is a story about a family of strong women in quest of stable identities and purposeful lives. Even fifty years later, Manyo still wonders why she was abandoned by her outlander family. It is a question she’ll never be able to answer, just as Japan itself must forge ahead into the 21st century without looking back.